A blanket of color is draped across a bare cliff face above the beach. 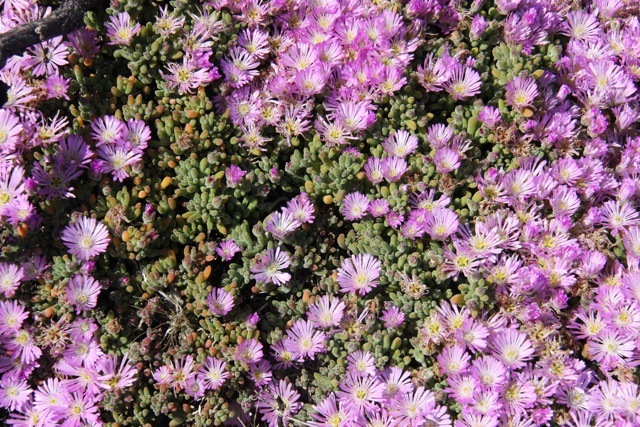 Gray-green succulent leaves–shaped like tiny sausages–form a dense mat that in turn is covered with bright pink flowers. Though the blooms look like daisies at first glance, they are actually in a totally different family (the yellow centers really are many stamens, not individual flowers). This is rosy iceplant or Drosanthemum floribundum. Rosy iceplant has a very different look from the much more common (and invasive) iceplant, Carpobrotus, though it is in the same family. Common iceplant has large wedge-shaped leaves the size of crisp green french-fries, and the flowers are much larger. 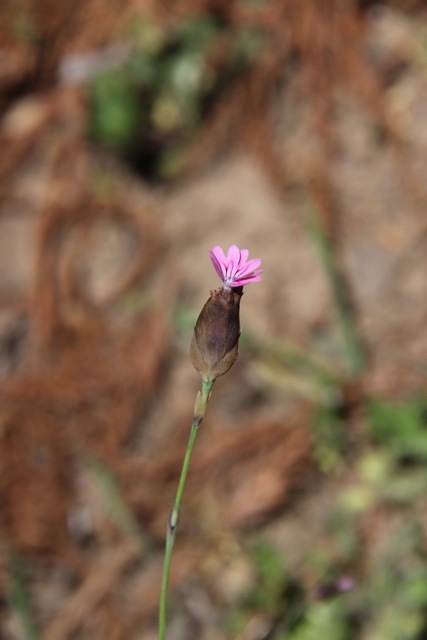 The little leaves of rosy iceplant are only about 1cm long. 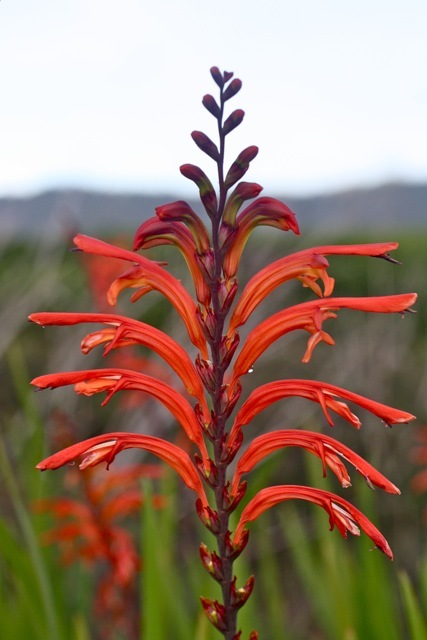 This native to South Africa was originally planted to control erosion, according to the Marin Flora. 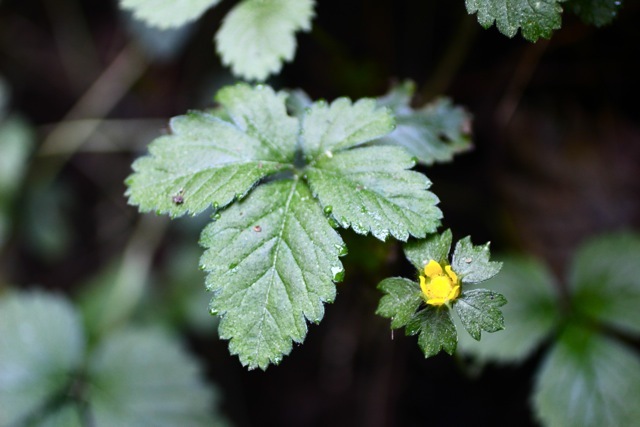 It spreads easily, rooting at the stem nodes, and has expanded from large patches near Duxbury Reef in Bolinas into many other parts of Marin. This little plant stands along the trail like a tiny, tiered pagoda. The upper leaves are a deep purple, but despite its name, purple deadnettle (Lamium purpureum, also known as henbit) doesn’t look at all dead. 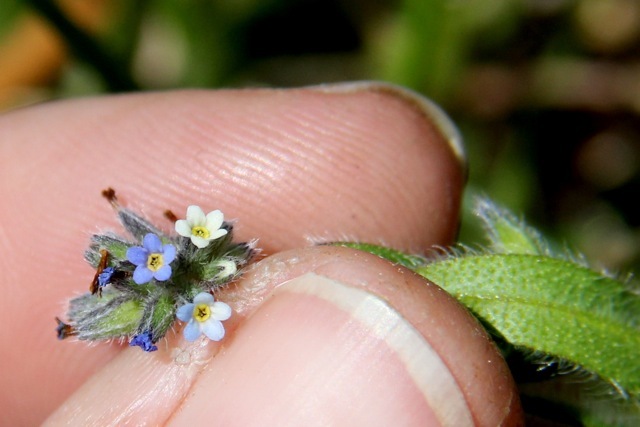 The square stem and the shape of its leaves and flowers give it away as a member of the mint family. 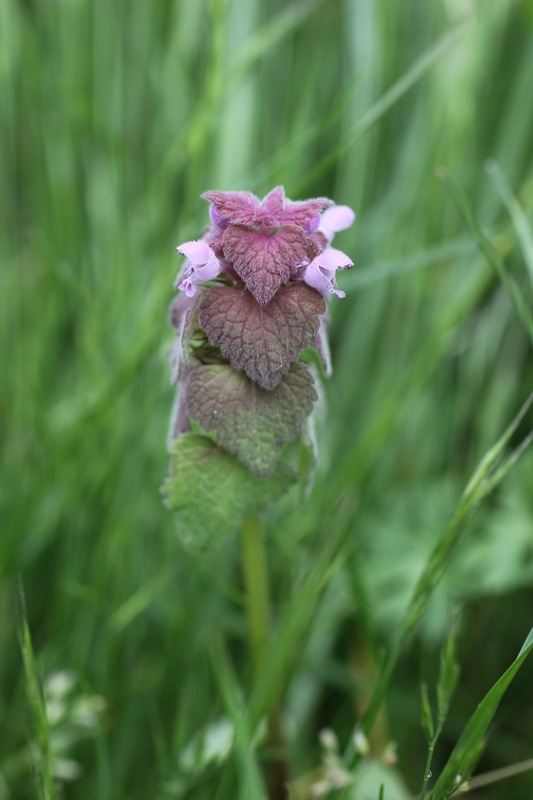 Purple deadnettle is native to Europe and Asia but has naturalized in California and many parts of the US. The young leaves are edible and used in salads and stir-fries. Romulea rosea growing among other leafy plants. 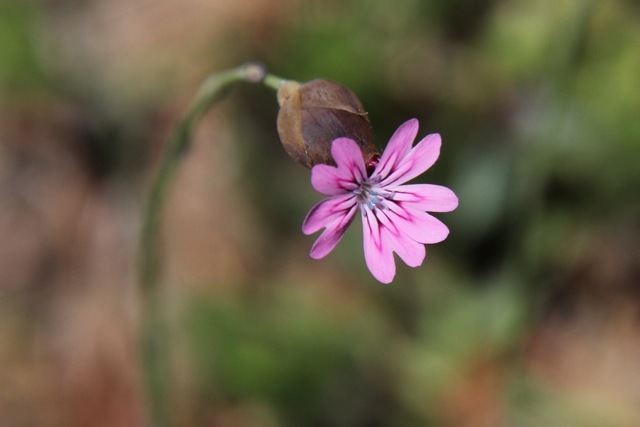 A flash of pink is nestled at ground level, surrounded by long grass-like leaves. 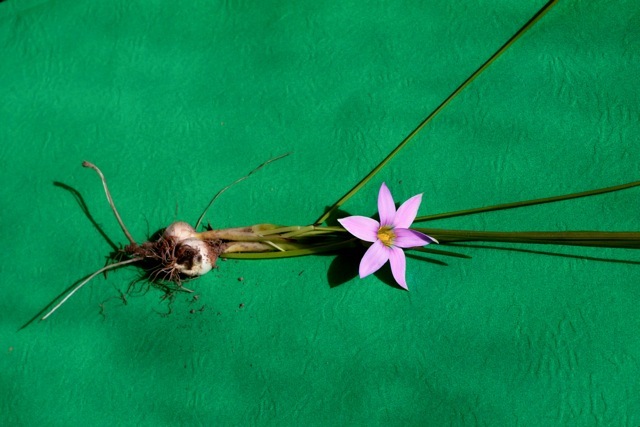 This is rosy sandcrocus, or Romulea rosea, a South African native that is in the iris family. And though superficially it doesn’t look at all like an iris, there are certain similarities if you know what to look for. 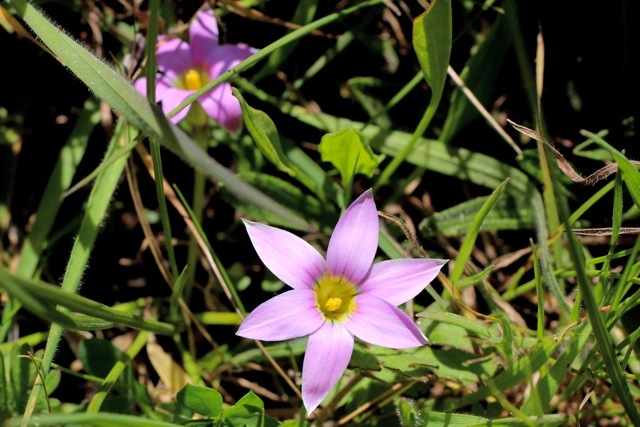 Rosy sandcrocus has six pointed pink petals, and long linear leaves with parallel veins running all the way to the end. Beneath each flower is a slight bulge in the stem, which is actually the ovary where seeds will develop (many flowers have “superior” ovaries, which means they are snuggled in among the petals rather than below them. The “inferior” ovary is a characteristic of the iris family). Six petals, and leaves as described above, are also key characteristics of Iridaceae. 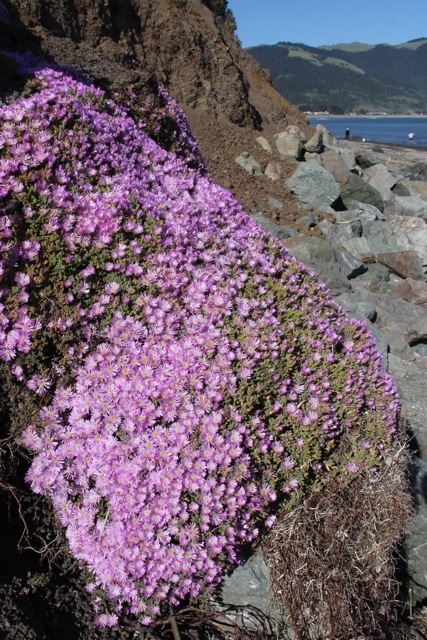 The rosy sandcrocus was first collected in Marin in 1979, and probably was accidentally brought to the area in a load of clover seed from Australia, according to the Marin Flora. In places, it takes over entire areas–looking a lot like a field of grass, except for when the pink flowers are blooming. 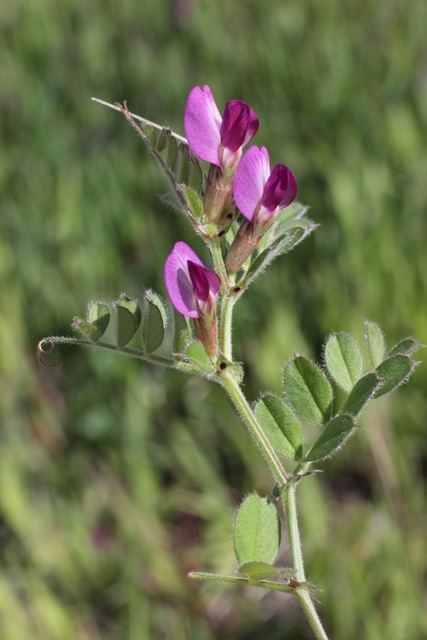 Overall it isn’t abundant in California, and the places you do find it tend to be weedy, disturbed areas–often with dry, sandy, or compacted soils. This little perennial sprouts from a pale, bulb-like corm. Swaths of yellow seem spray-painted on the landscape as I drive across Mt. Tam on Pantoll Road. This is green wattle, or Acacia decurrens, yet ANOTHER naturalized acacia. As I keep writing about this genus, the more it seems like a game of mix-and-match. All the species look superficially similar, yet all have distinct combinations of leaf shape and flower type that make it easy to tell one from another. The pom-pom-like flowers of green wattle remind me of those fiber optic table lamps that were popular back in the 80s: the ones where shafts of light dance up a spray of delicate filaments. There is something space-agey about these little blooms. They make a lovely sight, especially when they are fresh and surrounded by the tree’s dusky-green, feathery leaves. Each leaf is bipinnately compound, meaning the blade is divided then divided again into myriad tiny leaflets. This also is the only local acacia to have true leaves, not simply overblown, leaf-like petioles called phyllodes. 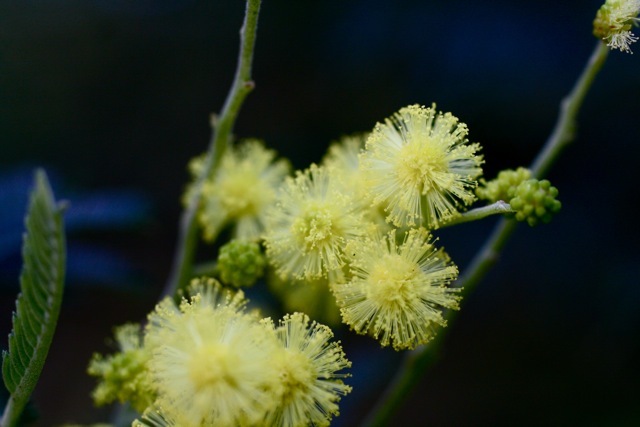 Green wattle is not native, but not listed as invasive by CalFlora. 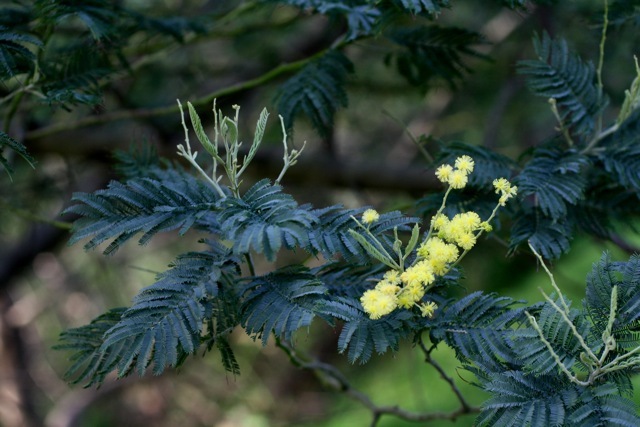 As with the other acacias, it is native to Australia. It also goes by the names wattle and black wattle–a wacky Aussie name if I’ve ever heard one! I never knew there were so many different types of acacia! But there are, and it seems like they are all in bloom at once. 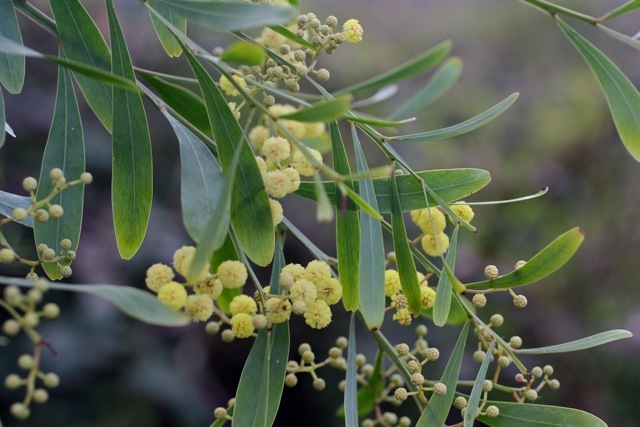 Today’s plant is everblooming acacia (Acacia retinoides). This is in the pom-pom tribe–whereas the others that I’ve written about so far are in the bottle brush tribe. The flowers of everblooming acacia are tiny yellow balls of fluff. But be warned–it has cousins with very similar-looking flowers, so you need to look at the leaves to be sure which species you are seeing. Everblooming acacia has blade-shaped leaves with one prominent central vein. Except, just to confuse you, the “leaves” of almost all acacia trees are actually phyllodes–modified petioles (usually just the leaf stem) that have morphed to look like full-blown leaves. For this reason, in the key the central vein is actually called a “nerve”, which is its technically correct name. Like the other acacias, this species is native to Australia and has naturalized into the semi-wild places near town. 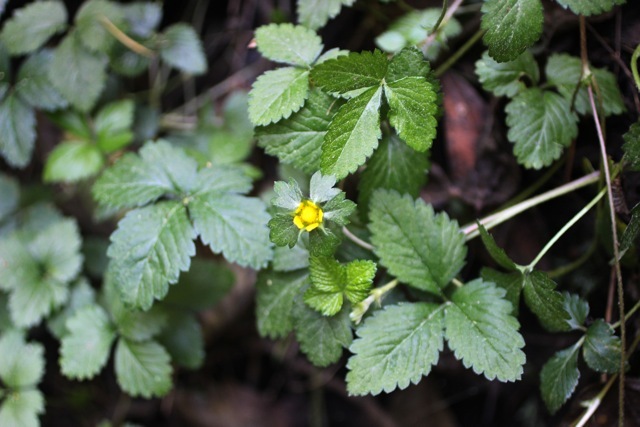 Unlike some species, it isn’t highly invasive and doesn’t spread far from where a parent plant once was planted–but it can be weedy on a local scale.